Corporate commuter shuttles are taking off in San Francisco area, and with good reason. We have a vibrant, bustling city where everyone wants to live, paired with our unique geography that’s hemmed in by water, prohibiting the kind of urban sprawl that happens in many other cities in the US. The dense urban area leaves many companies with no choice but to be located outside the city, sometimes at a distance that’s longer than the comfortable commute. The most competitive companies want to offer their employees the opportunity to live in the city and still get back and forth to work with the least possible hassle. This has led many of these companies to implement a corporate commuter shuttle service, which picks up their employees at their homes and then transports them to work. Here are five of the companies who have implemented these shuttles. Apple’s campus in Cupertino is located approximately 45 miles from the city center of San Francisco, and they send regularly-scheduled shuttle buses up to the city at intervals to pick up their employees. This makes certain homes on or near the Apple shuttle route more attractive to Apple employees. After all, who wouldn’t love to not have to drive to work? The Googleplex in Mountain View also sends regularly-timed corporate commuter shuttle buses to various San Francisco neighborhoods to pick up employees and transport them to work, a distance of approximately 35 miles. Depending on the traffic and the time of day, that can be a brutal commute for drivers, but when only the bus driver has to worry about the traffic, the rest of the employees can relax in the wifi-equipped, air-conditioned bus and begin their day calmly and productively. Ebay has several locations around the San Francisco Bay area, so the distance from downtown San Francisco varies, from eBay Advertising in Brisbane, only 8.6 miles from downtown, to their corporate campus in San Jose that’s more than 50 miles from downtown SF. A corporate commuter shuttle route makes a lot of sense, as each shuttle eliminates approximately 50 vehicles from being driven by individual employees making their way to work. Genentech’s headquarters are much closer to downtown San Francisco, at only about 10 miles from downtown, but the benefit of having a corporate commuter shuttle route is still strong. This biotechnology company has a large campus with multiple buildings, so they also incorporate intercampus shuttles to help move people seamlessly and effortlessly from one point to another within their campus. Yahoo is another company with multiple buildings on their corporate campus, all clustered near each other in Sunnyvale, CA. Located approximately 40 miles from downtown San Francisco, Yahoo finds it to be profitable to attract top talent by offering employees the chance to “have their cake and eat it, too” by making it easy to live in the city, even though they working at a distance that would be uncomfortable to commute on a daily basis. 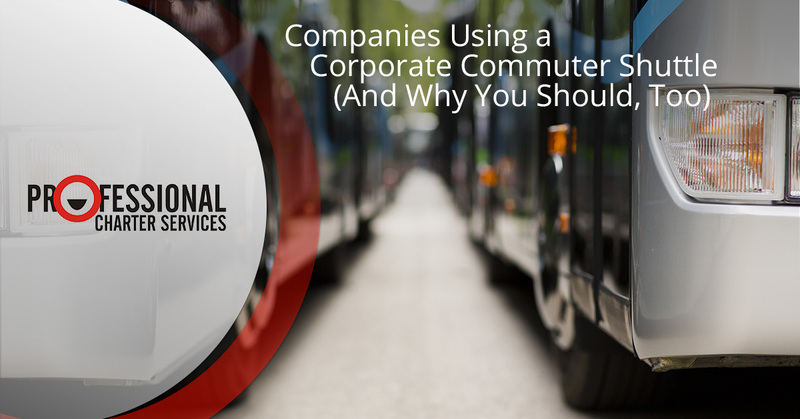 You don’t have to be as big as one of these companies for it to be worthwhile for you to implement a corporate commuter shuttle program for your employees. If you have thought that a corporate commuter shuttle would be too difficult to implement, think again. You don’t have to own or operate the shuttle yourself, and you don’t have to have multiple locations. All you need for a corporate commuter shuttle to make good business sense is to have one building or campus and have a number of employees who live at a distance from you but who are concentrated in or near the same geographical region as each other. You don’t even have to have 40+ employees who could use the shuttle. Even if you had only 12-20 employees that you needed to shuttle back and forth, it could still work, as you would simply use a smaller vehicle. In fact, these smaller shuttles offer even greater customizability, as you can consider picking people up at their homes instead of at a central location. Read more about our corporate commuter shuttle program and also check out our corporate commuter shuttle blog posts to see whether it might make sense for you to incorporate this option. Your employees will love it. You’ll be cutting down on emissions and minimizing your company’s carbon footprint. You’ll reduce vehicle congestion by replacing all your employees’ cars with one single shuttle. You’ll have employees who walk into work feeling calm and productive rather than frazzled and stressed from bad drivers, traffic, accidents, road construction, and road rage. To find out how much it would cost for you to implement a corporate commuter shuttle for your company, please contact Professional Charter Services today. We look forward to working with you to implement a strong, viable, and affordable shuttle service for your employees. Contact us today!